The hourglass of time has been stolen by the infamous cat burglar La Forge! Solve pictographic puzzles as you travel across the globe and through time itself. Journey through critical points in history from the Napoleonic wars to the birth of the United States. 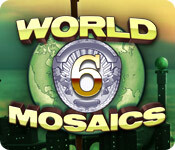 It’s up to you solve the puzzles and stop La Forge in World Mosaics 6!